Children's toys are going more and more high-tech each year. We asked five reviewers under the age of 12 to try the latest gadgets--a digital camera, a handheld, an e-book reader, a laptop, and a cell phone--designed specifically for a child to use. Here's what the kids had to say about the toys after putting them through their paces (with a little added perspective from moms and dads). Noah took to the camera fairly quickly, figuring out the controls and effects with little adult guidance. When he asked about the lightning-bolt icon, his uncle told him to take a picture with it on and another with it off to see what happens. Once he did, he understood that it was for the flash. Noah really liked the different effects that he could apply to photos in the camera, saying, "I just love how when you press the swirl button you can make a cool mode." The camera allows you to use special effects on your photos, such as stretching a dog's ears. He also liked the ability to plug the camera into a TV with the supplied AV cable to see what his photos looked like on a bigger screen. On the flip side, however, Noah thought that it was hard to figure out how to view the pictures he already shot, that it was difficult to open the cover over the USB connector, and that the lens was placed in such a way that his fingers often covered it. Uncle Nick's take: "The age level is appropriate for this camera. It was definitely helpful for Noah that the camera covered only the basics." Noah's bottom line: "It's fun to take anywhere" and "I wish it had a touchscreen!" Note: The camera is currently out of stock on the company's site, but a representative says that it is for sale at Toys R Us. When the Leapster Explorer arrived at Zoe's home, she was very excited since she thought it was a Nintendo DS, which it slightly resembles. 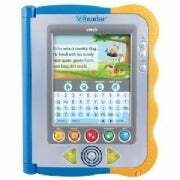 Zoe's father, who helped her install the Explorer software necessary to purchase and download one of the more than 40 games and activities from the Leapfrog site, was unhappy with the setup. "I found the software very slow and frustrating to use, and it was a good hour before I could manage to see the available games," Dad reports. "Then there were a lot of miscategorizations, and apps that were not available for download even though there were previews of them." Zoe thought the system and most of the activities and games she tried were "babyish." This included one that her father thought would be a sure-fire hit: the Disney Princess pop-up book. One exception was the Spongebob Squarepants Fists of Foam game, which earned the Zoe seal of approval. Dad's take: "A Nintendo DS or something similar, or even an iPod Touch, would be a better choice for Zoe. The Explorer appears to be well made and strong. However, it seems a little expensive at $70, especially since that includes only one game." Ryan tried the V.Reader on a 300-mile car trip. Tucked in the back seat of the car, he held the reader in his hands and stared at it. "What do I do first?" The on/off button is hidden behind a corner and takes a couple seconds to respond. Once the reader came to life, he started to play a spelling game. The idea was to fill in the blanks in an incomplete word by choosing the correct letters from a set dancing across the screen. On subsequent startups, he would touch a small house icon and get stuck repeating a setup routine every time. "Type your name!" the reader would implore. "But I already typed my name!" Ryan would complain to the screen. "Type in a welcome message!" the reader would then insist. "What's a welcome message?" he would ask. To hear and read a story, players are supposed to touch a book icon. But the problem is that the icon doesn't look much like a book and isn't labeled 'Book', even though all of the other icons have labels. When Ryan accidentally stumbled across the story, he enjoyed following along with the animated scenes and turning the pages when prompted. "This is a good story. But it's a little sad," he commented. Mom's bottom line: "It's difficult to imagine a 3- or 4-year-old getting much out of the reader other than hearing a story. The device seems more suitable for the upper end of the age range. The V.Reader made a great companion for a lengthy car ride, but it had a hard time holding Ryan's attention once we were home."